Since opening in Zamalek, few have been able to resist the charm of Olivo, which managed to nail down and even kick-off the trend the pizza bar in Cairo. It’s been so successful, that now it can proudly boast a new branch at Sheikh Zayed’s Arkan Plaza. Unlike their Zamalek and Katameya branches, this one has a very colourful outdoor area with a little cute five-seated bar, randomly painted old school chairs and a cute tree in the middle, which is why we unusually went to Olivo at 3PM. The indoor area has a beautiful industrial interior with high tables on the left, regular tables in the middle and a bar with a beautiful painting behind it; it sounds like a lot, but it’s definitely more low-key like the other branches. 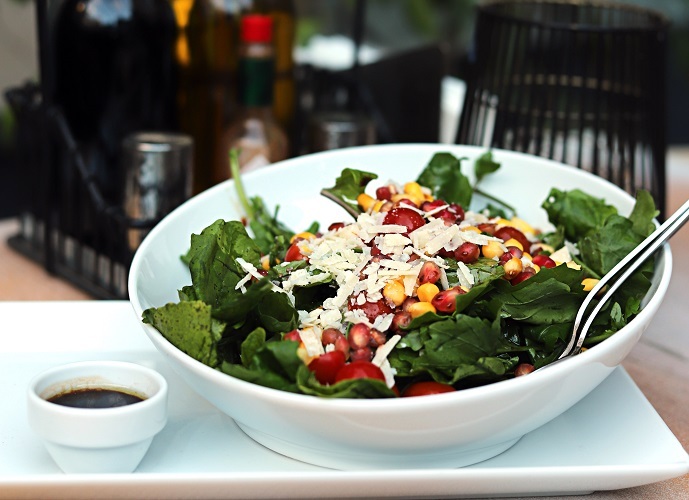 We kicked things off with Rucola Salad (45LE). Served with a mini bowl of their special sauce, it consisted of rucola leaves topped with sweet corn, sliced cherry tomatoes, pomegranate and shredded Parmesan cheese. The ingredients were all fresh with a mix of sweet, nutty and fresh flavours that came all together with their tangy balsamic vinegar-based dressing. Now let’s talk about the pizza, shall we? We opted for the Bresaola Pizza (135LE) and the Sausages Pizza (145), as well as the Funghi Pizza (125LE) with extra truffle oil (35LE). O.liv.o’s pizzas might appear quite basic at first sight, but when it comes to flavours, textur, and quality of the ingredients, you’ll definitely understand why everyone is so in love with it. The imported ‘00’ Italian flour is the reason why the dough is crispy and pleasantly chewy; the surface of the pizza was moist and handled the toppings without getting too soggy. Even the charred edges are delicious. Starting with the bresaola, it was topped with lots of rucola, cherry tomato, mozzarella, a sprinkle of Parmesan cheese and just the right amount of tomato sauce, which didn’t overpower the rest of the toppings, as well as bresaola – of course. 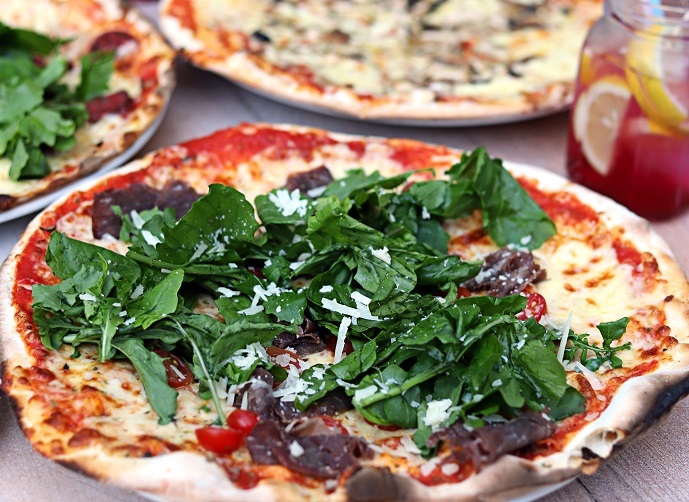 The tomato sauce was well seasoned and had a spot-on consistency, the cheese was melted to perfection, there was plenty of bresaola which was well distributed on the pizza and the whole presentation was just colourful. However, the bresaola itself lacked the sweet flavour and lean texture we were expecting. The sausages pizza, on the other hand, was flawless. The sausage was bursting with flavours of a unique blend of spices and its texture was smooth, while the caramelised onions added a great sweetness that complimented the sausage perfectly. As for the funghi pizza, it’s great if you’re just looking for something straightforward; a cheesy pizza with classic tomato sauce and mushrooms on top. The addition of truffle oil was a great match to the mushrooms, giving the overall flavour more earthiness. We finished our meal with a Nutella Pizza (105LE) for dessert; the pizza was topped with a generous amount of Nutella, crumbs of biscuits and slices of marshmallows that were toasted, but retained their gooey centre. 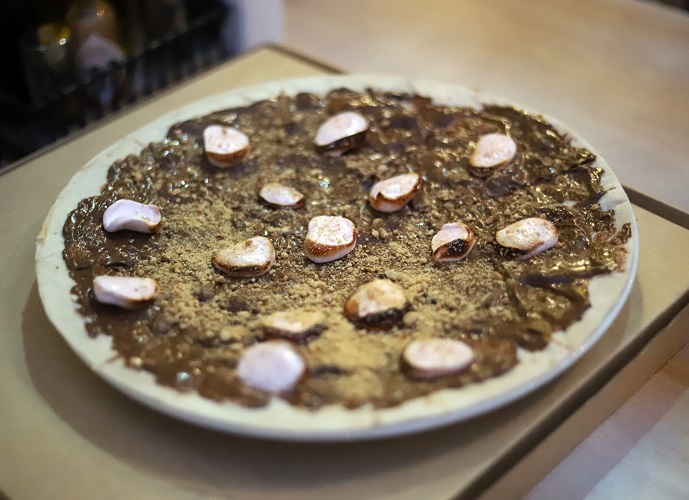 We absolutely fell in love with this s’mores-like pizza and how the dough was much thinner and softer the savoury – so much so ones that it’s hard to eat it with your hands. We found that the best way to eat it is by folding two pieces and turning it into a crepe-like pizza. You’re welcome. Excluding that the waiter mentioned there’s a minimum charge 200LE at the very beginning of our visit, and that the service was slightly clumsy and slow, we can’t think of anything else to complain about. We fell in love with their new venue, everything about the food was just great, and their prices are actually quite good for what it is. We’ll definitely go back again. Apart from being surprised to find that there was a 200LE minimum and that the service was slightly slow throughout our visit, there was little to complain about. We love the new venue, the food was on-point and the prices are actually pretty digestible for what you get. We’ll definitely go back again. And again. Reservations are highly recommended for weekends. More so than it's other branches, this one is perfect for lunch, dinner or just a couple of drinks on the fly. A 200LE minimum seems steep when the most expensive pizza is no more than 150LE.